High quality, full color business cards are a great way to impress your contacts. Whether you're a starting businessman, or a company that realizes the power of advertisement, you know that business cards are a great way to reach out to thousands without having to spend large sums on other forms of advertisements. So take advantage of our low prices, high quality and let us help you elevate your business to new heights! Select from pre-made designs or upload your own business card. 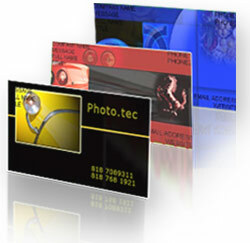 Art-Tec Prints has full color, quality Business Card design ideas that set you apart and give your organization a true professional look and feel.